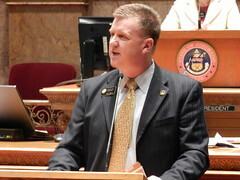 Senator Scott Renfroe represents State Senate District 13 which includes most of Weld County and including the cities of Greeley, Evans, Windsor and Eaton. He serves as the Senate Republican Caucus Chairman who is responsible for convening caucus meetings and organizing the legislative efforts of the Colorado Senate Republicans. Tell Senator Renfroe what issues matter to you! Scott Renfroe grew up in Greeley, where he met his wife Pamela while they were attending Eaton High School. He graduated from Colorado State University with a degree in business administration. Scott Renfroe and his wife Pamela live north of Greeley with their five children: Olivia, Sylvia, Vivian and twin sons Derek and Spencer. For more information please visit www.ScottRenfroe.com. After graduating college, Scott Renfroe worked for a Los Angeles law firm as a paralegal. Then returned to Greeley and went to work at his family’s concrete business, Foundations Builders, Inc. Later, he became vice president and part owner of the Weld County concrete company. Renfroe’s strong business sense and knowledge led him to serve as president of the Weld County Builders Association, a member of the Weld County Building Trades Advisory Board and the Greeley Building Inspection Advisory Board. Scott Renfroe was twice elected to the Eaton School District Board of Education. Currently, Renfroe serves on the board of directors for West Ridge Charter Academy, a school applying for charter status in Northern Colorado. Scott Renfroe served as a trustee and later as deacon at the Evangelical Free Church of Eaton. Renfroe has also traveled to Belize and India on mission trips to assist those in need. Senator Renfroe is tireless advocate for fostering a strong business environment, limiting the size and scope of government, traditional family values and individual liberty.